You can always count on the New York Times to get your week off to a cheerful start, especially if you happen to be looking for a job. The Grey Lady is living up to her name this week, placing a giant cloud squarely in front of any rays of optimism we might have begun feeling in the last few weeks. Case in point: the following graphic, and accompanying article, which points out—rather starkly—that there's not really been a worse time to be looking for a job in the last decade. Having looked at the figures, it's important not to get too depressed by them: dwelling on the numbers (not to mention the widening gap at the heart of the graph between "openings" and "unemployed workers") won't do you any good in your job search. 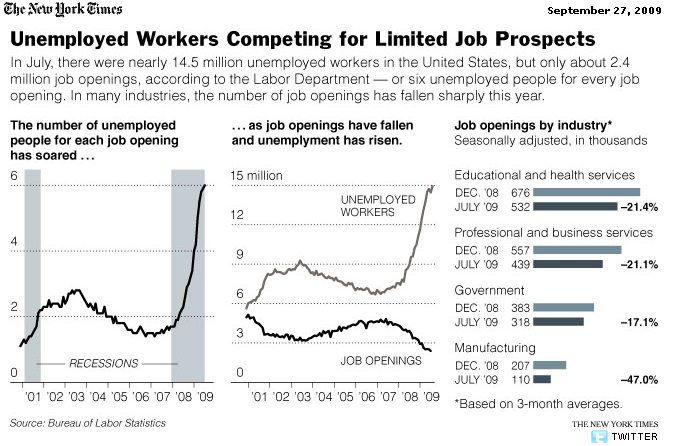 Sure, there might be six jobless souls for every open position in the U.S. right now. And, sure, unemployment might be hitting heights not seen for decades. But none of that should matter to you. Why not? Well, you're here at Pink Slipped for one thing. Not that I'm stroking our ego here (well—maybe a little! ), but the very fact that you're willing to get out, read advice, network and hunt down positions already gives you a substantial heads-up on a vast cross-section of the job seeking public (although feel free to let them know about us as well!). However bad the numbers and graphs may get in the coming weeks and months, it's important not to lose heart or faith in your search. Remember: there might be six applicants for each open position, but if you can make sure that you're the one that stands out, the other five don't need to concern you.